Fresh Fruit Cleanse is a weight loss and detox program designed to improve your health through enhanced nutrition. It was created by Leanne Hall – a yoga teacher – who experienced positive results in her wellbeing with fruit cleansing diets. Makes the peristaltic action of the intestines stronger. If you cleanse for more than one day you will eliminate excess mucous from your digestive system. Inorganic mineral deposits that contribute to arthritis are dissolved. Fruit is high in water and fiber while being low in calories making it perfect for weight loss. So on the fresh fruit cleanse you can eat a lot of food, feel satisfied yet still lose weight easily. The fruit cleanse also helps you develop an appetite for healthy food, putting you in control of your cravings. The right cleanse for you depends on your goals and current lifestyle. Before commencing the cleanse you should eat a healthy, macrobiotic diet for one or two days. A sample macrobiotic menu is provided. This is a good cleanse to do once a week to purify your liver, kidneys, and bloodstream as well as reset your appetite. It is also beneficial when you feel like you are coming down with an illness. If you are new to cleansing diets this gentle cleanse would be a good choice for you. This cleanse is recommended after festive holiday weekends such as Thanksgiving and the Fourth of July. This cleanse is most appropriate during seasonal change to align yourself with the natural environment. It includes some larger meals to maintain your energy levels. However, you will actually see greater weight loss and cleansing results compared to the shorter cleanses. If you are an experienced cleanser or feeling ambitious and want to see major results you can try the 7-day fruit cleanse. Because it is a longer cleanse it is best to plan to do it at a time when you have the opportunity to rest more. Each option includes a detailed meal plan with recipes based on fresh fruit. Hall explains that zucchini, eggplant, tomatoes, cucumber and spaghetti squash are usually called vegetables but they are actually non-sweet fruits. These foods feature in many of the recipes providing more variety and satisfying, savory meal options. Mango, apple, pear, banana, raspberries, plantain, dates, figs, orange juice, lemon, tomato, cucumber, green peppers, spaghetti squash, eggplant, zucchini, avocado, coconut milk, spirulina, raw cacao, hemp seeds, flax seeds, olive oil, balsamic vinegar, herbs and spices. It is good to rest while you are cleansing so no exercise is required on this program. Hall does recommend yoga because it has benefits for your body, mind and spirit. Additionally it involves slow, deep breathing that calms the nervous system and helps you let go of tension. 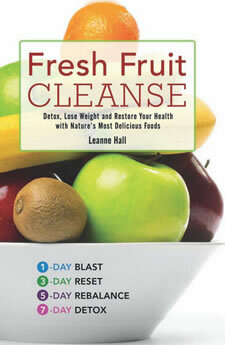 Fresh Fruit Cleanse retails at $13.95. Offers a gentle way to cleanse and detox your body. Affordable in comparison to many other detox programs. Includes options for four different cleanses depending on personal preference. Encourages the consumption of a large amount of fruit and vegetables. May improve the symptoms of chronic health conditions such as irritable bowel, arthritis and cancer. Includes detailed meal plans, recipes and shopping lists. Is not strictly a fruit cleanse as it includes a variety of other foods in addition to fruit. Necessary to prepare all meals at home for the duration of the cleanse. Some dieters may experience uncomfortable detox symptoms such as headaches, fatigue and digestive discomfort. Fresh Fruit Cleanse offers a gentle way to detoxify your body while enjoying eating nutritious, satisfying fruit-based meals. This program allows you to detox and improve your health without the need to fast or follow extremely restrictive diets.